This WORKstation APRON-front sink from Ruvati's Verona series combines the best of both world: a bold stainless-steel apron-front with a functional workstation: built-in accessories (colander, cutting board and roll-up rack) that slide on the integrated tracks in the sink. Includes a deep stainless steel colander that you can use as strainer. The solid cutting board is constructed of sapele wood (African Mahogany) - a luxurious hardwood that has a beautiful finish and handles water well. The roll-up rack fits on the top track and is ideal as a dish drying rack. It is constructed of stainless steel bars and a flexible silicone frame allowing you to fold it or roll it up tightly for storage. 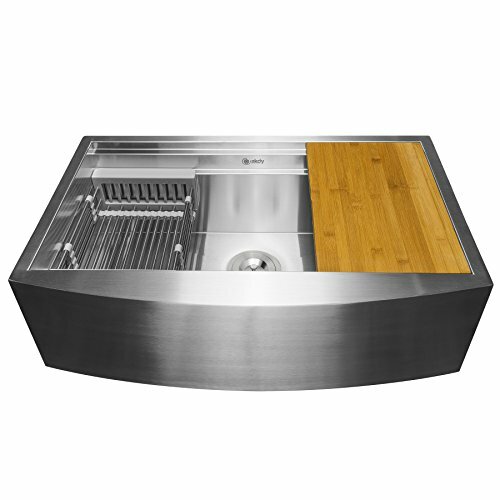 The sink is constructed from 16 gauge stainless steel, one of the thickest steel available for residential kitchens. Ruvati uses T-304 grade stainless steel with a 18:10 Nickel:Chromium content ensuring that your sink is completely resistant to rusting. 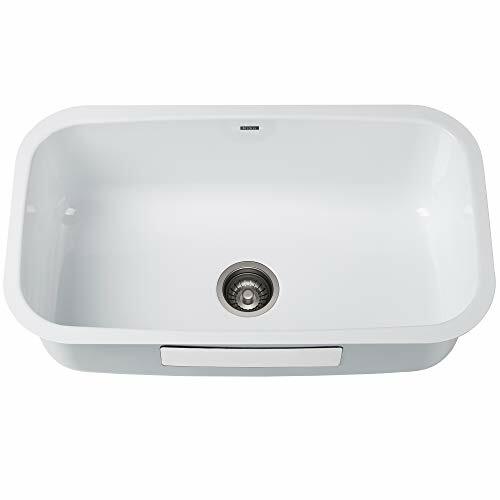 Thick heavy-duty soundguard coating and thick rubber padding on the outside of the sink bowl on all sides provide sound insulation against noise and thermal insulation against condensation. Ruvati's unique 10mm tight radius inside corners offer a slightly curved corner for easy cleaning while at the same time retaining the resolutely modern look. The inside of the sink and the arpon-front is finished in commercial grade brushed finish which adds to the beauty of the sink. The slanted bottom of the sink and the drain grooves channel water towards the drain. The sink comes with bottom rinse grid that protect the sink from scratches when you place pots and dishes. Exterior dimensions: 33" (wide) x 22" (front-to-back). Interior bowl dimension: 30" (wide) x 16" (front-to-back). Bowl Depth: 10". Standard 3.5" drain opening will fit any garbage disposal unit. Included in box: Sink, Cutting Board, Colander, Roll-up rack, bottom rinse grid, basket strainer drain assembly, cut-out template. Ruvati USA Limited Lifetime Warranty. - Handle style: Double Lever. - Spout height is 8.9"
- Max Deck Thickness: 1.18"
- Spacing between two mounting holes: 8.0"
- Mounting hole diameter: 0.9" to 1.3"
NOTE: Matching drain and hot & cold water hose are not included. Overall height:13.03", Spout height is 8.93", Max Deck thickness: 1.18". Fit 1/2 IPS Female Straight Thread Supplying lines. High arch design provide more clearance and better access to the sink. Please Note: sink drain and hot & cold water supplying lines are not included and should be purchase separately. 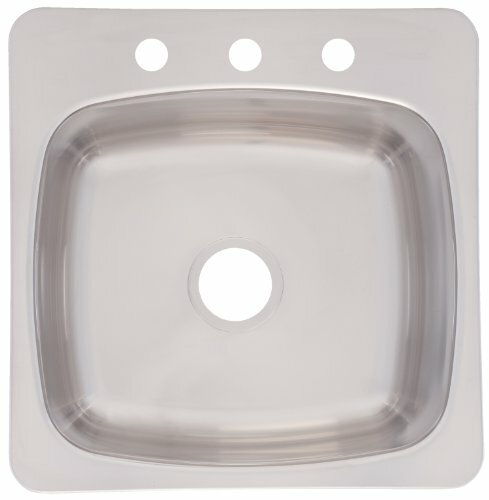 Safety & Strength: Safe-T rims protect you from sharp edges during installation and add strength to the sink. Ruvati is one of the premier names in kitchen and bath. With manufacturing and distribution facilities in US, Europe and Asia, the Ruvati name is synonymous with exceptional quality products and outstanding customer service. This Ruvati sink from the Gravena collection offers a modern, linear style with rectangular bowls. 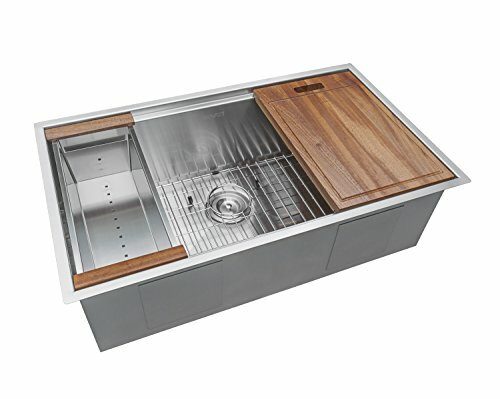 The sink is constructed from 16 gauge stainless steel, one of the thickest available for residential kitchens. Ruvati uses T-304 grade stainless steel with a 18:10 Nickel:Chromium content ensuring complete resistance to rusting. Thick heavy-duty soundguard padding and spray-coating on the outside of the sink on all sides provide sound insulation against noise and thermal insulation against condensation. The inside of the sink is finished in commercial grade brushed finish which adds to the beauty of the sink. Unlike the dull satin finish used by other competitors, Ruvati's brushed finish gives a richer look, masks scuff marks better and matches other stainless steel appliances. 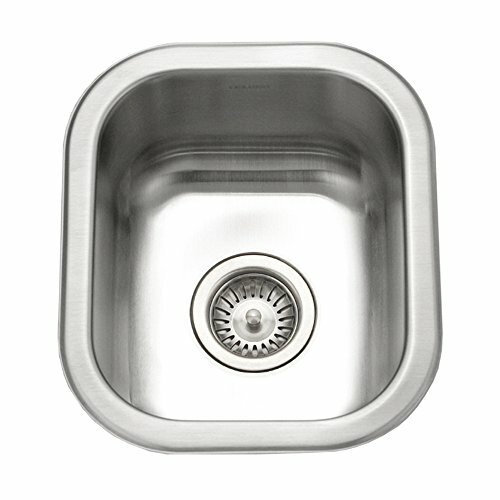 This sink features Ruvati's unique edgeX 10mm tight radius which means the inside corners of the sink have just the right amount of curve making the sink easy to clean. Other comparable sinks in the market use 20mm radius corners which look a lot more rounded and thus less refined. The sink features DUALmount installation: 1" rim all around that has the same brushed finish as the inside of the sink, allowing the sink to be installed undermount or flush-mount. The slanted bottom of the sink and the drain grooves channel water towards the drain. The sink comes with bottom rinse grids that protect the sink from scratches. The basket strainer drain is a great addition: it traps food waste that can be easily emptied into the trash. Exterior dimension: 30" (wide) x 18" (front-to-back). Interior dimension: 28" (wide) x 16" (front-to-back). Bowl Depth: 10". 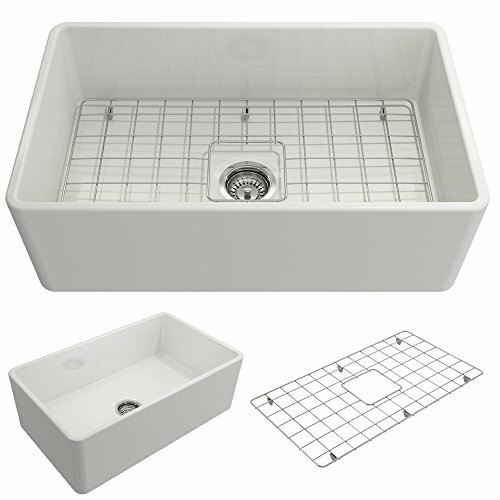 Included in box: Sink, cut-out template, mounting brackets, rinse grid, basket strainer. Ruvati USA Limited Lifetime Warranty. 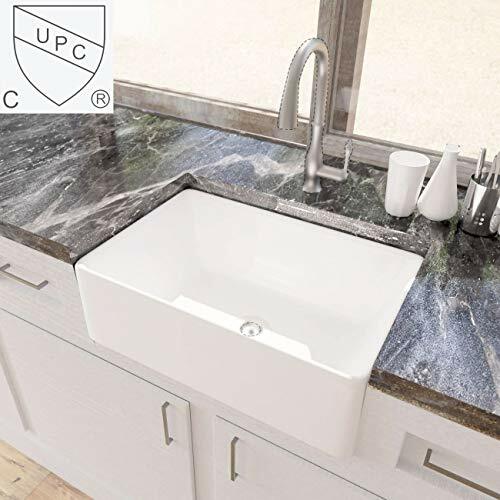 cUPC CERTIFIED CERAMIC BASIN: This sink meets U.S. and Canada high-quality standard (Uniform Plumbing Code), certified by IAMPO. Delivery Warranty KES uses high quality packaging-extra-thick foam cushioning and strong corrugated cardboard box to insure the basin won't be damaged during delivery. If there is any problem related to product, please feel free to contact us! Premium quality ceramic construction is modern and elegant. Extreme resistance to chip, discoloration, scratching and cracking. Dimension: The overall length is 30.12-inch; the overall width is 19.88-inch; the overall height is 9.84-inch. No faucet holes, requires wall-mount or counter-mount faucet. Search for B00G4RBX2W or B00HCXN5PA. 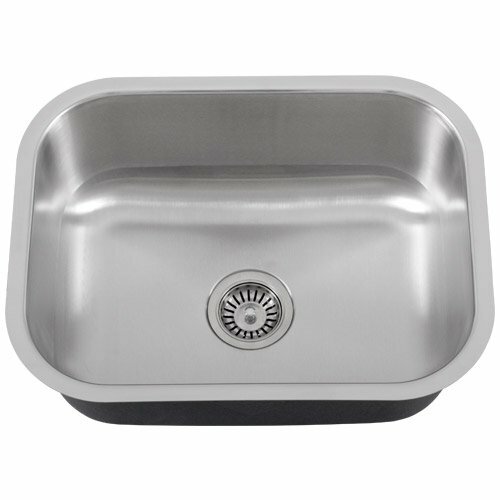 This hand crafted Firebird KS0101 33-inch top mount kitchen sink has an easy to clean surface. The smooth brushed stainless-steel shows beautiful, and amazing craftsmanship. The sink is perfect for washing; like preparing various cooking items, ingredients, utensils and dishes. If any trash or debris fall within the sink have no worry, a strainer will capture any trash that might get into your drain. The adjustable tray can expand by unlocking the position and sliding the tray to adjust the range from 14.5" to 22.25" max. This is perfect for creating extra space to continue additional prepping or letting utensils dry. Insulating rubber is installed on the bottom of the sink to keep vibrations and loud sounds at bay for a better experience. This is a great choice for your new renovation project, or just upgrading to a more stylish kitchen sink. 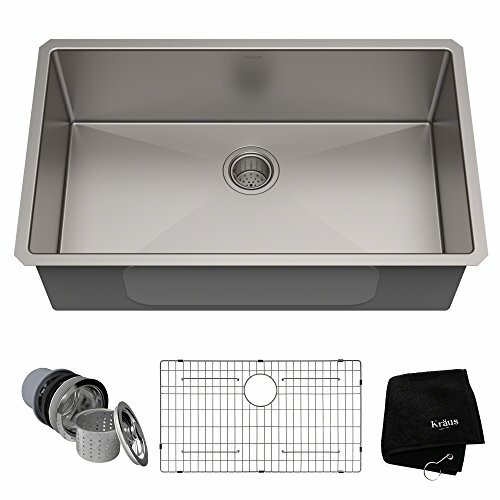 A drain kit, tray, and all hardware needed for installation is included. BOCCHI Farmhouse sinks bring back the ultimate material to your kitchen. Fireclay, a 100% natural organic and recyclable material used by Craftsman for centuries to create timeless appliances has now returned to your kitchen. With the firing in our Kilns up to 2000 f temperatures, fireclay becomes the most durable material used in today's kitchens. Thus, dealing with extreme heat coming from pots and pans is definitely not a problem. Due to their special glaze coating fused with the fireclay body, our sinks have a non-porous, uniform, scratch and stain resistant surface. With its protective bottom grid and distinctive looks, BOCCHI Farmhouse sinks are truly crafted to match your design and functional desires. New to the collection this year, the Apron Farmhouse Handmade Stainless Steel Sink is revolutionary to say the least. 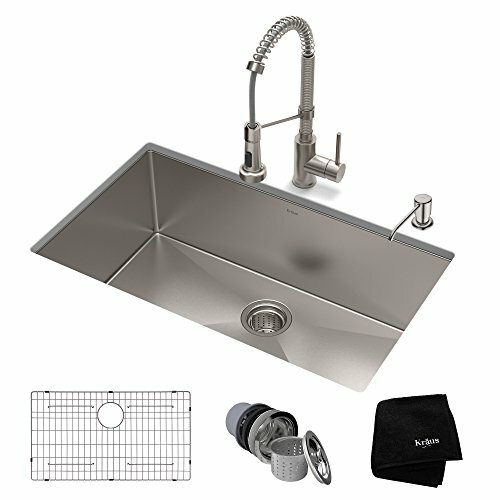 With a uniquely corner design, you get all of the beauty of a designer stainless steel sink while meeting your every day kitchen needs. It is as functional as it is fabulous. It's seriously the best of both worlds. You don't like washing the dishes? Transform your laundry room into a work of art and we are sure you'll enjoy it! Created with premium stainless steel, this hardworking sink features an extra deep bowl for soaking, scrubbing or washing delicates. 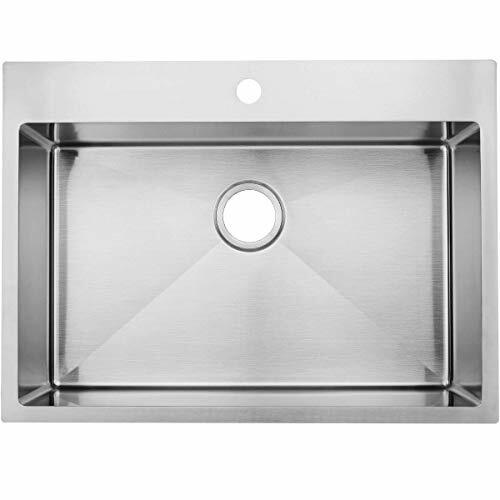 Quality materials: stainless steel Easy to clean Center drain placement Single bowl design for easy functionality Contemporary design Dimension: 33" L x 20" W x 9" H Basin(s) Size(in. ): 28" W x 18" L Adjustable Tray Cutting board (FDA Regulated) ADD TO CART NOW and you ll be 100% satisfied with this amazing Handmade Stainless Steel Sink! 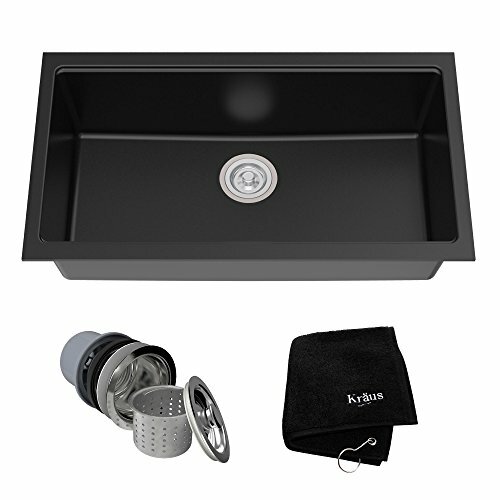 HIGH QUALITY MATERIALS: This is a handmade sink, made from durable stainless steel can easily stand up to constant use and handle your toughest kitchen tasks. Extra safe construction for superior strength and durability, fully undercoated and padded, scratch resistant satin finish. 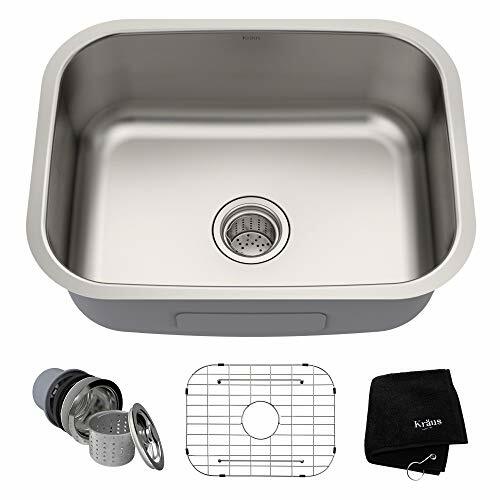 COMPLETE SET: This practical Single Bowl Space Saving Kitchen Sink includes a drain strainer kit, adjustable tray and a cutting board. The unique smart space saving designed allows the sink colander & cutting board to be sliding inside the sink. 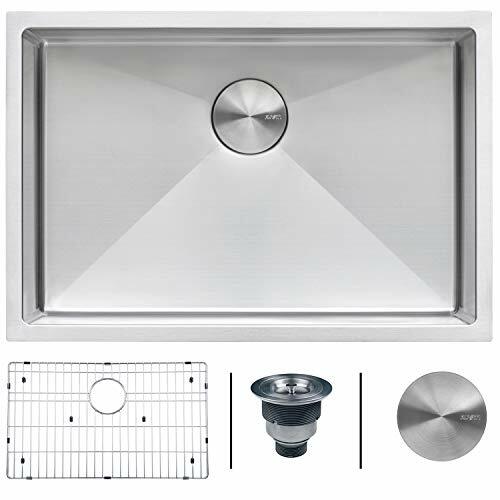 EASY TO CLEAN AND INSTALL: Featuring our easy-to-clean satin polished finish, Apron Farmhouse installs effortlessly and offers rear-placed drains designed to improve usability and maximize functional cabinet space beneath the sink. 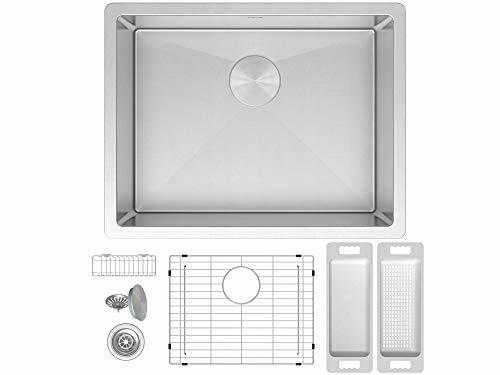 VERY SUITABLE: Apron Farmhouse Handmade Stainless Steel Sink lets you customize your sink for your individual lifestyle - whether you're a large family, a weekend gourmet, or a city-dweller with limited kitchen space. 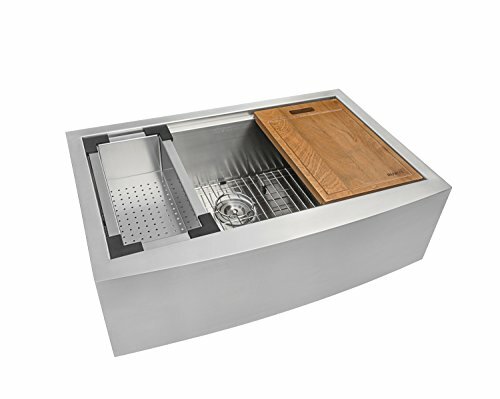 The Houzer CS-1307-1 Club Series Small Undermount Bar/Prep Sink is an attractive, functional stand-alone or a creative companion sink. Its compact size and simple, clean lines make them stylish and functional additions to any kitchen or bar area. This model is made of 18-gauge T304 stainless steel and bowl measures 10.125-inches by 12.0625-inches by 6-inches deep. It features lustrous satin finish with highlighted rim, eXclusive SpecPlus Edges and StoneGuard undercoated over Super Silencer pad that helps reduce clattering sound of glasses and silverware, while eliminating condensation under the bowl. Includes mounting clips and template for added convenience. Meets ASME A112.19.3-2000, UPC and CSA standards and covered by limited lifetime warranty. Fits 18 inch cabinet. For over three decades, Houzer has been improving millions of kitchens across America and overseas, one sink at a time. Houzer offers over 100 sensational models in Stainless steel, Quartz Granite, Fireclay, Porcelain Enamel steel, and Copper to match any design from traditional to contemporary. Houzer believes that sinks can make your life in the kitchen easier and more enjoyable. Ruvati is one of the premier names in kitchen sinks. With manufacturing and distribution facilities in US, Europe and Asia, the Ruvati name is synonymous with exceptional quality products and outstanding customer service. Ruvati products are loved by customers, and trusted by leading interior designers and home builders. This Ruvati sink from the Gravena collection offers a modern, linear style with rectangular bowls. 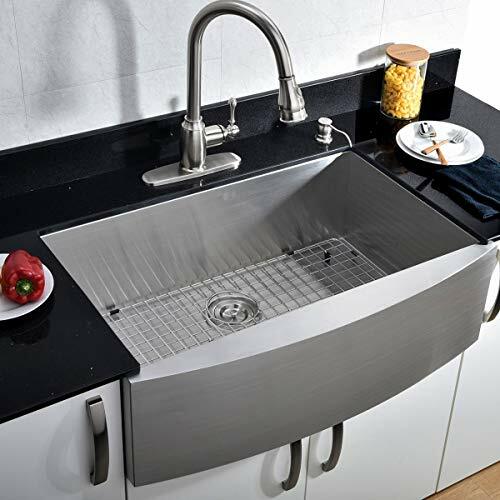 This sink is constructed from 16 GAUGE stainless steel, one of the thickest steel available for residential kitchens. Ruvati uses T-304 grade stainless steel with a 18:10 Nickel:Chromium content ensuring that your sink is completely resistant to rusting. Ruvati's unique 10mm tight radius inside corners offer a slightly curved corner for easy cleaning while at the same time retaining the resolutely modern look. Comparable sinks from other manufacturers are either 15mm or 20mm radius corners which take away from the square look of the sink. Thick heavy-duty soundguard padding and coating on the outside of the sink bowl on all sides provide sound insulation against noise and thermal insulation against condensation. The inside of the sink is finished in commercial grade brushed finish which adds to the beauty of the sink. DUALmount installation: The sink features 1" rim all around that has the same brushed finish as the inside of the sink, allowing the sink to be installed either undermount or flush-mount. The slanted bottom of the sink and the drain grooves channel water towards the drain. The sink comes with bottom rinse grids that protect the sink from scratches; and a basket strainer drain that traps food waste. Exterior dimensions: 28" (wide) x 19" (front-to-back). Interior dimensions: 26" (wide) x 17" (front-to-back). Bowl Depth: 10". Minimum Base Cabinet: 30". Standard 3.5" drain opening will fit any garbage disposal unit. Included in box: Sink, cut-out template, mounting brackets, rinse grid, basket strainer. Ruvati Limited Lifetime Warranty. Zuhne kitchen, bar, prep, RV, utility and laundry sinks are preferred by architects and builders for high end homes all over the world. Our commitment to product quality, customer service and honest pricing means that you get the best for less. Unlike most sellers on Amazon, we are American owned and operated with a proven time-tested track record of delivering quality products, topping bestseller lists and averaging the highest number of positive reviews. GENUINE 16 GAUGE RUST PROOF STAINLESS - top to bottom, inside out. No false advertising! 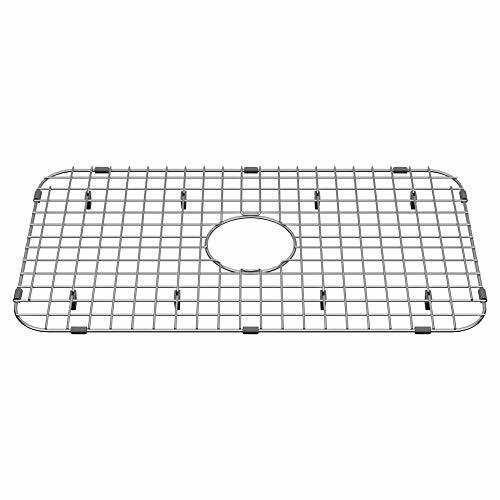 Bottom grate, caddy and strainer are also made from commercial grade 304 - other brands use lower grade stainless for accessories. QUIETEST SINK IN THE WORLD - Innovative insulation engineering that performs 2.5 times better than other sinks. You can barely hear utensils or water hitting the sink - even waste disposers are muted. The quietest sink in the world is also the safest for protecting cabinets from condensate damage. SAFE FOR FAMILIES - Zuhne stainless products are made using nontoxic parts and processes to exceed the highest lead control standards globally. Certified to US and Canada plumbing codes. AESTHETIC, DURABLE AND FUNCTIONAL - Zuhne 10mm rounded or coved corners are more difficult to manufacture than the industry standard 20mm radius. R10 is the optimal balance between sleek rectangular appearance and easy maintenance. 304 Stainless bottom grid for protecting sink from scratches. 304 Designer drain strainer with lid stopper for neat aesthetics. Using a waste disposer? Lid is compatible with waste disposer flange so that you can use the lid even if you are not using the strainer. Mounting hardware, cut out template & manual. SIZE: Exterior 21 x 18 x 9, Bowl 19 x 16 x 9, Min Cabinet 24 In. MORE 5 STAR REVIEWS THAN ANY DROP IN OR UNDER COUNTER SINK Rust and corrosion proof. Dent and scratch resistant. Industrial strength construction suitable for heavy residential and commercial use. Built like a tank from surgical grade lead-free genuine 16G T304 18/10 Posco stainless. Simply wipe with a cloth to keep sink sparkling and hygienic forever. QUIETEST AND SAFEST SINK IN THE WORLD Experience noise control evolution in sinks with best-in-breed insulation technology that is 2.5 times superior to other brands. Mutes Insinkerator and Waste King garbage disposals. Drain boiling water, flush ice or defrost items in the sink without worrying about condensate damage to your expensive cabinets. SAVE TIME COOKING AND CLEANING Experience quick drain and dry with sloped base channels. 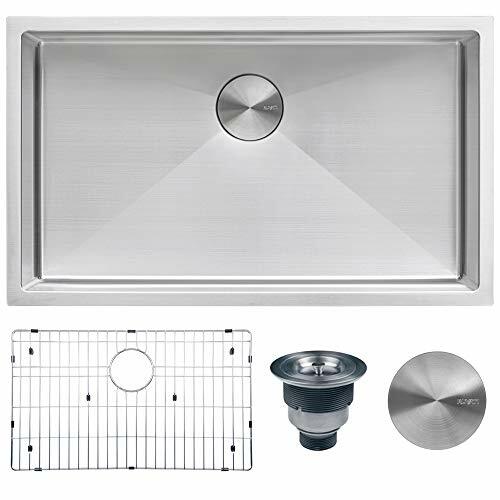 Rear set 3.5 drain unlocks extra sink, countertop and cabinet space - store large items or install pull out trash can under the sink. Included accessories help you organize work area efficiently and converts sink into a workstation. FAMILY-FRIENDLY DAILY USE SINK Tight radius R10 coved corners look great and are easy to clean. Extra deep & wide bowl for large pots and pans or tall stack of dishes. Water doesn't splash out of the sink. Soft glow brushed satin finish is easy on the eyes and matches stainless appliances. Certified sink that outperforms UPC standards for US and Canada. LIFETIME WARRANTY, FREE RETURNS Round the clock customer and contractor support from US call center. Fits all waste disposers. 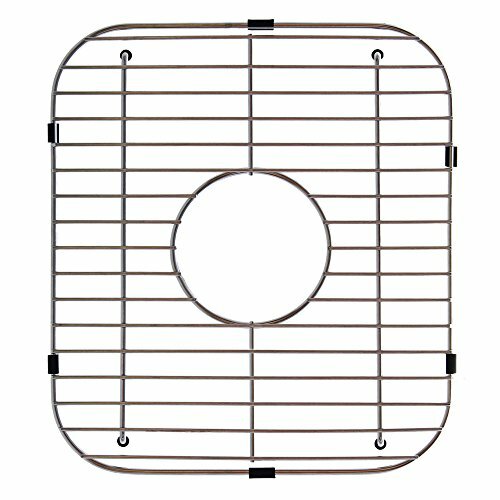 Includes bottom grid, drain strainer with stopper, mounting hardware, cut out template and manual. For precision countertop machining CAD drawings or DXF files are available for free download. Size:29 3/4" x 20" x 10"
- Premium T-304 Stainless Steel Construction; 16-Gauge Steel for Added Durability. - Commercial-Grade Satin Finish, Scratch and Stain-Resistant. - Sound Insulated with Extra-Thick Rubber Dampening Pads; Stone Guard Coating. - Channel Grooves Engineered for Optimal Drainage. - Fits the most common garbage disposal system. Engineered for a lifetime of use. Covered under a 10 year limited warranty. Free of charge within 30 days return. 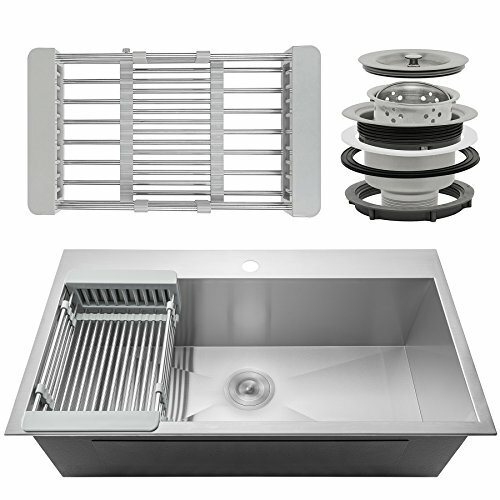 Package Included: a stainless steel drain assembly with removable basket strainer; a stainless steel dish grid. NOTE: This sink is very big, 29 3/4" Length x 20" Width x 10" Depth. To avoid buying wrong size product, please pay more attention to its size before purchase. Performance: Very easy installation, Resistant to dents and scratches, Suitable for all counter top. Texture of Material: Premium T-304 stainless steel construction and brushed nicked finished for corrosion, stains, scratch and dents resistance. 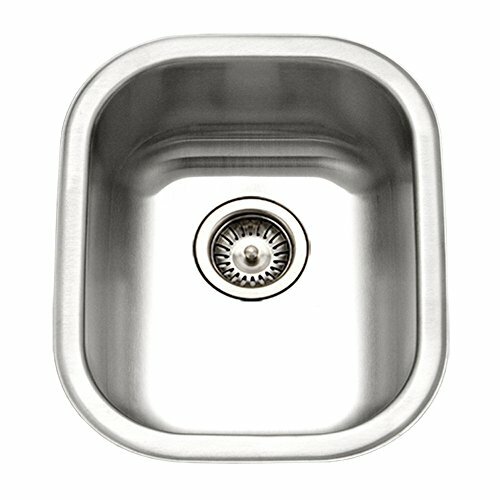 Sink Dimension inch : 29 3/4 x 20 x 10, 16 Gauge 304 Stainless Steel Satin Brushed Finished . 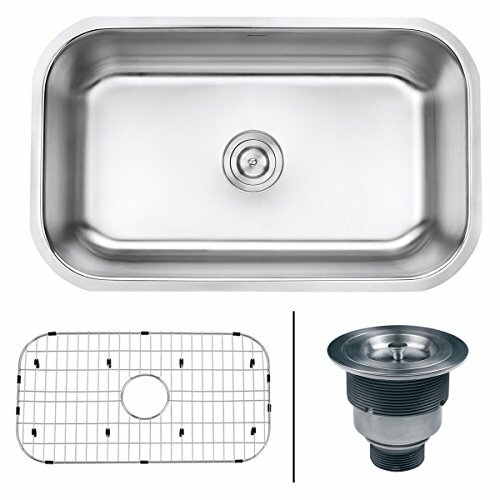 Complimentary Accessories: a stainless steel drain assembly with removable basket strainer; a stainless steel dish grid. Kraus undermount granite sinks create an instant style upgrade for the kitchen. Constructed from 80% natural granite, with the look and feel of real stone, these modern kitchen sinks look striking in a variety of settings. Clean lines and thoughtful design details highlight the organic elegance of granite, for an eye-catching look with contemporary appeal. The extra-deep basins accommodate large dishes with ease, while the gently rounded corners make sink maintenance simple. Each non-porous, naturally hygienic sink is protected with a thermal finishing process, creating a surface that is highly resistant to heat, chemicals, scratching, chipping, and discoloration. This single bowl sink provides a lifetime of functionality with refined style. For added convenience, a basket strainer drain assembly and complimentary towel are included free with purchase. Constructed from premium stainless steel, the top-quality basket strainer assembly creates a tight seal to prevent food and debris from clogging the drainpipe. For easy installation, all mounting hardware is provided. Experience Kraus Quality and bring your best kitchen ideas to life. 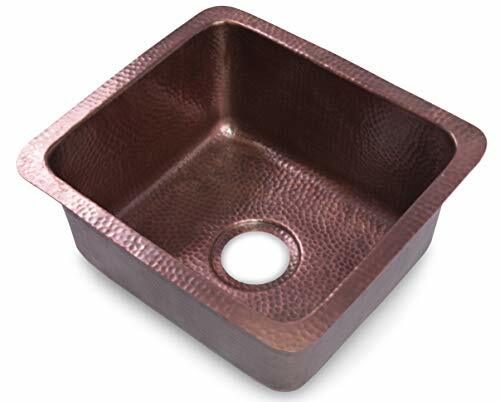 Monarch Abode s Baxter Bar Prep / Single Bowl Kitchen Sink is made of Pure Copper and individually handcrafted by our skilled artisans to provide a one of a kind, single bowl sink for your bar or kitchen area. Our Baxter sink is hand hammered providing a unique and beautiful texture that will catch the eye of anyone in the room. Note: DO NOT use corrosive / abrasive cleaning liquids or material as that will damage the copper finish. Exterior Dimensions: 28"L x 20.5"W x 10"D; Interior Dimensions: 30"L x 16"W x 10"D; 10 Inch Extra Deep Single Bowl. 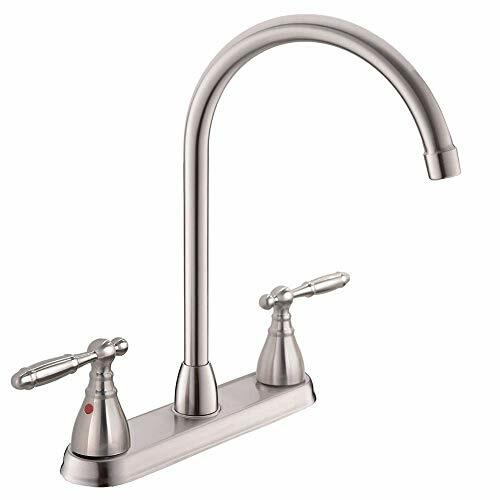 Premium Quality: T-304 Stainless Steel Construction ensure scratch-resistant usage; 16 Gauge(1.3mm) Sink Body ensures your long-lasting and durable lifetime use. Sound Barrier Technology: With 3mm Thick Rubber Dampening Pads and Stone guard Undercoating. Accessories NOT Included. Standard 3-1/2 Drain Opening That Fits the Most Common Garbage Disposal System. Stainless Steel Reimagined: Express yourself with the distinctive style of KRAUS Pintura Series sinks. Offering the timeless appeal of cast iron transformed for today s kitchen with a light and resilient steel core, these versatile sinks provide endless design possibilities without the need for specialized installation. Each sink is fired at high temperatures of 1500 F, creating a virtually indestructible non-porous porcelain enamel surface that s highly resistant to impact, scratches, chips, and stains. The smooth high-gloss finish easily wipes clean, and will not dull or fade over time. Proprietary Noise Defend sound dampening technology provides exceptional sound reduction when the sink is in use, with extra-thick rubber dampening padding that eliminates noise from dishwashing and waste disposal. The undermount configuration is designed for seamless installation with a variety of countertops and makes it easy to wipe water straight into the sink. Experience the extraordinary durability and unmistakable style of Pintura enameled stainless steel sinks, and enjoy the advantage of Innovation for Real Life. 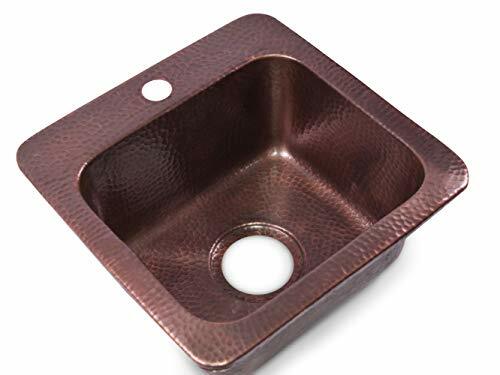 Monarch Abode s Highball Sink is made of Pure Copper and individually handcrafted by our skilled artisans to provide a one of a kind sink for your home bar and kitchen areas. Our Highball sink is hand hammered providing a unique and beautiful texture that will catch the eye of anyone in the room. Monarch s Dual Rim will allow you the flexibility of either installing your Atlas Bar Prep Sink as an under mount sink or a drop in sink. The Stainless Steel Sink Grid from American Standard protects your sink from scratches and dents when washing heavy pots and pans. Equipped with rubber feet and side bumpers, this durable grid will guard against the rigors of everyday wear.